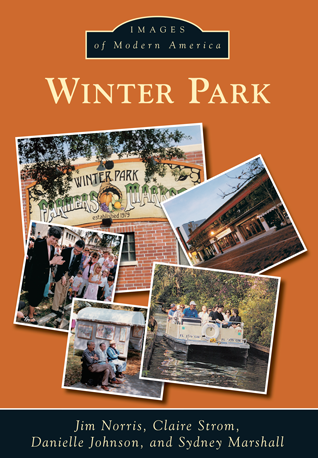 Winter Park is a unique community in central Florida. Its old-world charm and walkable downtown have drawn visitors from around the country and the world since the town's foundation in the 1880s. Residents and visitors alike enjoy the city's world-class cultural offerings, including the largest collection of Tiffany glass in the Morse Museum, the music of the Bach Festival Society, and theatrical performances at the Annie Russell Theatre. Winter Park citizens have been actively involved in world events, serving in wars, protesting wars, and sending relief to those in need. The wealth of the community, in conjunction with the presence of Rollins College, has attracted visits from many prominent people, from Spiro Agnew to Maya Angelou. Jim Norris and Claire Strom are history professors at Rollins College, where Danielle Johnson and Sydney Marshall are undergraduate students. Most of the images in this book were provided by the Rollins College Special Collection and Archives, the Winter Park Public Library, and the Winter Park Historical Society.